1) This paper has been prepared for XXIV FIG International Congress in Sydney, Australia, 11-16 April, 2010 and will be presented in the Commission 3 Key Note Session: SIM in Support of Mega City Management. The paper gives an introduction to FIG publication no. 48 – “Rapid Urbanization and Mega Cities: The Need for Spatial Information Management” that will be launched in Sydney. This paper briefly presents the resolutions of a research made within FIG Commission 3 on the topic. The extended research study is published in FIG publication 48. The goal of this research is to investigate the emerging needs, the current trends and the extent of using SDIs in selected megacities, but also to identify the emerging possibilities for using new technical tools for the governance of sustainable large urban areas applied by the surveying- mapping- data processing community. The methodology followed included experience gained through the general current FIG Com 3 activity to improve management of expanding urban areas, review of existing publications and other sources, Internet research on specific problems of megacities and on existing SDIs, on site visits to a selected number of megacities and interviews with individual decision makers in city administrations, and review and assessment of data received from questionnaires. Today there is an ever-increasing demand for the collection, integration, management and sharing of reliable spatial information, and the relevant education, experience sharing and development of best practices. This growing demand is driven by some of the most important changes in society which in turn are magnified by rapid urbanisation and the conditions of the world’s megacities. It is the purpose of FIG and its Commission 3 (Spatial Information Management) to assist the profession in all aspects of spatial data management in respond to these challenges and in support of society everywhere. During the 2007–2010 term of office FIG Commission 3 has addressed the phenomenon of rapid urbanization and its impacts. Its particular focus has been on identifying spatial tools and general principles, norms and standards for good governance using reliable and accessible spatial information and providing guidance to interested countries to successfully address the problem of rapid urbanization. A central theme has been the formal access to land, property and housing for all. Further research will focus on climate change and disaster prevention and response, and other security issues that emerge due to rapid urbanization and accelerated development. FIG Commission 3 has cooperated closely with agencies of the United Nations (UN-ECE, WPLA, UN-HABITAT and GLTN), the World Bank, ISPRS and other sister associations. FIG publication 48 is a further contribution of FIG and FIG Commission 3 in this field. This paper briefly presents the recommendations presented in this publication, which should help governments, decision makers and professionals to deal with the major challenges of rapid urbanisation. Spatial information management in the support of good city governance. This current research study is responsive to the aims of the Commission 3 work plan and is a further contribution in this direction. It investigates the current trends in using spatial information in particular for the management of megacities, where needs are enlarged and urgent. Location, in the form of spatial data, is a key enabler to visualise current situations, predict impacts and enhance service delivery. Information about location is a natural integrator, capable of enabling complex analysis of spatial distribution of places, events and services; providing opportunities to link up government services, interact with customers and optimise delivery options. The value of spatial (location-referenced) data is growing in recognition internationally. Many countries with developed economies now have policies and strategies aimed at maximising the benefit from spatial data held by government agencies in particular. A wealth of existing map, image and measurement data can already be found in areas such as land administration, natural resource management, marine administration, transportation, defence, communications, utility services and statistical collections. The challenge is for users, both within and outside these areas of activity, to discover, access, and use this information to improve decision-making, business outcomes and customer services. As cities get larger spatial information is becoming a key resource in efficient delivery of e-government services, public safety, national security and asset management. In this study, it is proposed that a city-wide spatial data infrastructure linked to similar structures in other levels of government, can provide a sustainable solution to many problems of megacities. Despite all the progress made in spatial data collection, modelling and dissemination, it is important to look for ways and methods to improve e-government taking into account the needs of citizens. The goal of this research is to investigate the emerging needs, the current trends and the extent of using SDIs in selected megacities, but also to identify the emerging possibilities for using new technical tools for the governance of sustainable large urban areas applied by the surveying- mapping- data processing community. The study aims to demonstrate these technical tools, not only to governmental policy makers, but also to planners, economists, scientists, environmentalists, sociologists and all others with an interest in the life of megacities. However, it should be mentioned that each city should build its own spatial data infrastructure, and should choose its own tools appropriate to its own social, economic and cultural environment. The publication suggests alternative ways to meet the current requirements and makes general recommendations on best practice. It does not advocate the use of any specific tools because each country has a different history and experience. Identification of experience gained through the general current FIG Com 3 activity to improve management of expanding urban areas. Review of existing publications and other sources. Internet research on specific problems of megacities and on existing SDIs. On site visits to a selected number of megacities and interviews with individual decision makers in city administrations. Review and assessment of data received from questionnaires. 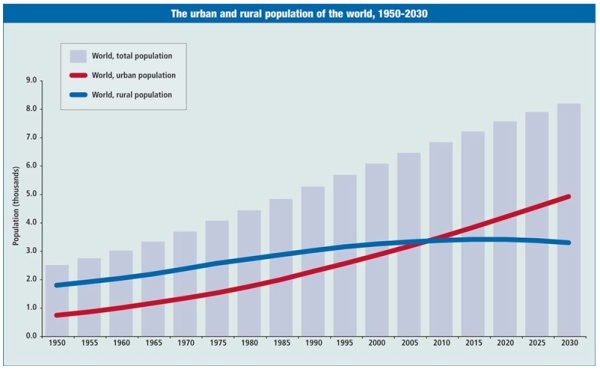 Urbanisation is a major change taking place globally. The urban global tipping point was reached in 2007 when for the first time in history over half of the world’s population 3.3 billion people were living in urban areas (Figure 1). It is estimated that a further 500 million people will be urbanised in the next five years and projections indicate that 60% of the world’s population will be urbanised by 2030. This rush to the cities, caused in part by the attraction of opportunities for wealth generation and economic development, has created the phenomenon of ’megacities’: urban areas with a population of 10 million or more. There are currently 19 megacities in the world and there are expected to be 27 by 2020 (Figure 2). Over half of this growth will be in Asia where the world’s economic geography is now shifting. 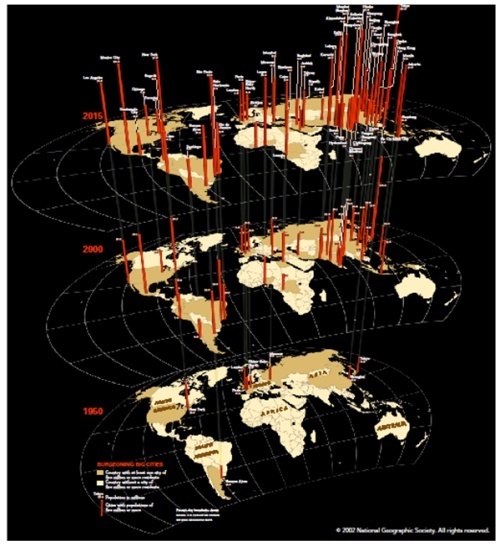 This incredibly rapid growth of megacities causes severe ecological, economical and social problems. It is increasingly difficult to manage this growth in a sustainable way. It is recognised that over 70% of the growth currently takes place outside the formal planning process and that 30% of urban populations in developing countries are living in slums or informal settlements, i.e. where vacant state-owned or private land is occupied illegally and is used for illegal slum housing. In sub-Saharan Africa, 90% of new urban settlements are taking the form of slums. These are especially vulnerable to climate change impacts as they are usually built on hazardous sites in high-risk locations. Even in developed countries unplanned or informal urban development is a major issue. Urbanisation is also contributing significantly to climate change. The 20 largest cities consume 80% of the world’s energy and urban areas generate 80% of greenhouse gas emissions worldwide (Figure 3). Cities are where climate change measures will either succeed or fail. Rapid urbanisation is presenting the greatest test for land professionals in the application of land governance to support and achieve the Millennium Development Goals (MDGs). The challenge is to deal with the social, economic and environment consequences of this development through more effective and comprehensive land administration functions, supported by effective Spatial Data Infrastructures, resolving issues such as climate change, insecurity, energy scarcity, environmental pollution, infrastructure chaos and extreme poverty. Administrations in large cities are often confronted with a multitude of key problems, like high urban densities, transport, traffic congestion, energy inadequacy, unplanned development and lack of basic services, illegal construction both within the city and in the periphery, informal real estate markets, creation of slums, poor natural hazards management in overpopulated areas, crime, water, soil and air pollution leading to environmental degradation, climate change and poor governance arrangements (Figures 4, 5). The inevitability of further population growth is a common issue. Some cities reported that their administrations have little control over population growth; it was a regional or national issue and must be addressed at that level. However, monitoring population change effectively and being able to respond through planning and infrastructure development will be major challenges. Informal settlements are a problem in many cities. An increasing number of citizens do not have either permanent or temporary access to land and adequate shelter. This exclusion is caused, in many cases, by structural social inequalities, inheritance constraints, conflicts, non pro-poor or pro-gender land policies and land administration systems that are ineffective and expensive for the end user. Without a range of appropriate interventions being applied within the broader context of economic growth and poverty reduction policies, social exclusion and poverty will continue to spiral out of control; already 90% of new settlements in sub-Sahara Africa are slums. Natural hazards and emergency management are major issues in most cities. Risk profiles from floods, fires, earthquakes and other hazards differ among cities, but capacity to plan, prepare, respond and recover from disasters is a common need. During 2007–8 for the purposes of this research study, initial data about problems facing city administrators were obtained from seven cities (Hong Kong, Tokyo, Seoul, Istanbul, London, New York and Lagos) either by their direct response to the questionnaire (Q) or by personal visits (V) and interviews by the authors and contributors. 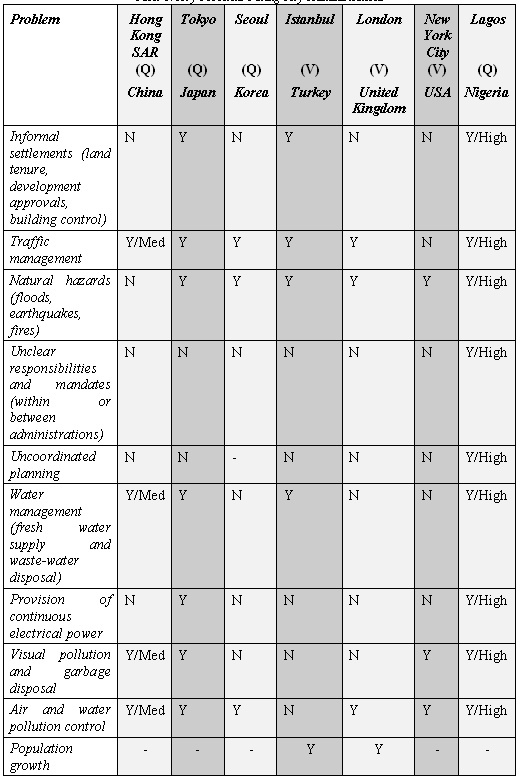 Table 1 shows the information derived from that stage of research. Many cities appear to have problems with unclear and overlapping responsibilities amongst internal and external agencies, leading to operational dysfunction such as a multitude of agencies holding non-accessible spatial information. For example, Sao Paulo comprises component cities all with their own governance arrangements. It is clear that solutions to problems facing megacities require concerted response from many internal units and regional and national agencies in areas such as planning, infrastructure, development and land use controls, transportation, environmental management and water management. Mandates might be clear, but rationalisation of functions and more effective levels of cooperation and information sharing are needed. Even if city planning is centrally coordinated, city administrations often have little control over the implementation (i.e. land use and building controls) of their policies and plans. 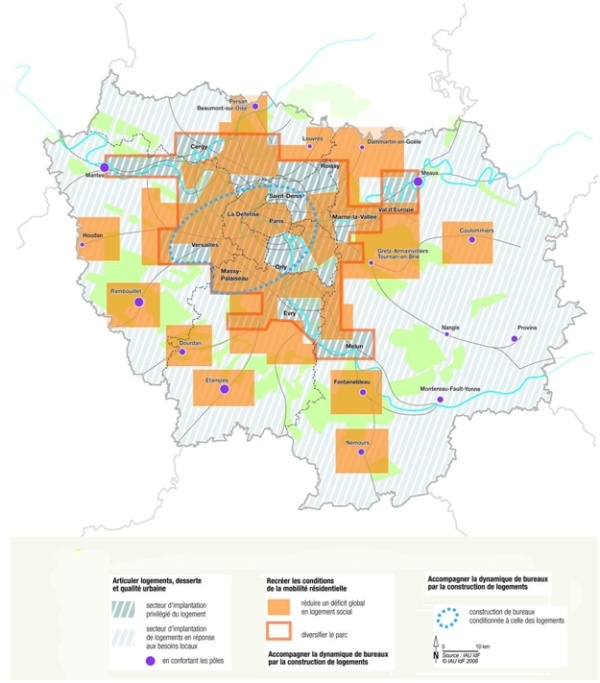 For example, in France the greater Paris region, Île de France, has a regional planning authority that sets planning policies for the highly decentralised 1,280 communes (fig.6). Political differences create tensions in the consistent implementation of these planning policies. The influence of megacities reaches well outside their administrative boundaries to the peri-urban and regions beyond. It is essential that the greater region be managed holistically to maximise the economic benefits of the city. Regional planning places even greater emphasis on effective governance of the larger region, even across international boundaries, with cooperation in planning, development control and sharing information being essential. In many cases, infrastructure providers are not a direct part of the city administration’s planning and development process, some are private enterprises while others may be located at another level of government. This causes problems with the proactive planning and strengthening of utility services. Most megacities support some level of civil society participation in the planning and design of their services, such as citizen involvement in the urban planning process. However, spatially enabled web based services are providing new opportunities to more closely involve citizens in consultations and land administration functions. 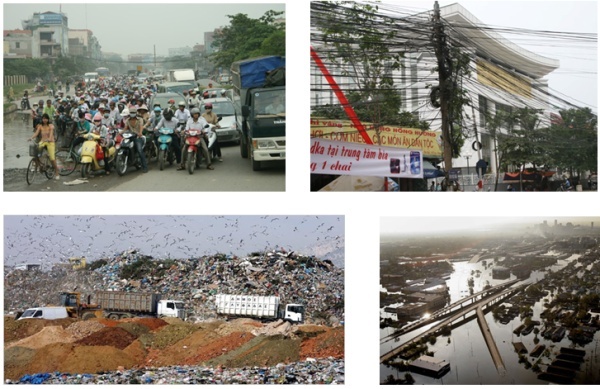 The rapid growth of megacities causes severe social, economical and ecological problems. How can this growth be nurtured in a sustainable way? The challenge for land professionals is to provide the megacity ‘managers’, both political and professional, with appropriate ‘actionable intelligence’ that is up-to-date, citywide and in a timely manner to support more proactive decision making that encourages more effective sustainable development. Spatial information has become indispensable for numerous aspects of urban development, planning and management. 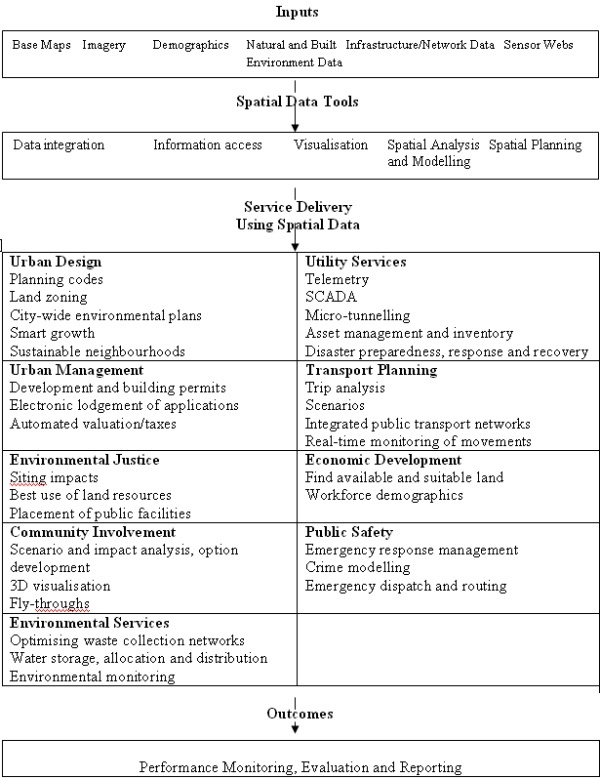 The increasing importance of spatial information has been due to recent strides in spatial information capture (especially satellite remote sensing and positioning), management (utilising geographic information systems and database tools) and access (witness the growth in web mapping services), as well as the development of analytical techniques such as high resolution mapping of urban environments (Table 2). These more efficient techniques can lead to a wider diversity of information that is more up-to-date. In some circumstances, a wealth of existing map, image and measurement data can already be found in areas such as land administration, natural resource management, marine administration, transportation, defence, communications, utility services and statistical collections. The challenge is for users both within and outside these areas of activity to break down the information silos and to discover, to access and to use the shared information to improve decision-making, business outcomes and customer services. The study has found that spatial information technology is being recognised widely as one of the tools needed to understand and address the big urban problems, but there is still a general lack of knowledge amongst communities of practice about what spatial solutions exist and how they can used and prioritised. Information to support the management of cities is traditionally channelled and aggregated up the vertical information highway from a local, operational level to a policy level. In developed countries, urban growth and its characteristics can normally be measured through information derived from the land administration functions. However, in the megacities of the developing countries, informal settlements are the norm, growth is rampant and administrative structures are limited. The traditional source of change information is not readily available there. The concept of using SDI to more efficiently manage, access and use spatial information across megacities is evolving and megacities are at different stages of their implementation. The EC INSPIRE Directive has provided welcome impetus across Europe and beyond. However, most cities have no strategic framework to guide and create their SDI. This reflects the difficulty of the task to create an SDI within megacities that are organisationally complex and involve a large number of stakeholders with diverse sets of spatial information; a microcosm of the national problem. City administrations have different interpretations of what constitutes an SDI, but most reported that they had at least some elements of an SDI already in place. Cities like Paris and New York have a more mature and comprehensive implementation of a megacity SDI, managed by dedicated resources. However, most cities reported that they had only small “central GIS units”, under-resourced and generally incapable of providing a comprehensive citywide SDI. Missing capabilities included no spatial data policies and standards, common metadata, formal data sharing arrangements between units or agencies, or shared data access mechanisms. It could be many years before mature and fully populated SDI emerge in megacities. However, it is important for megacities, especially in developing countries, to develop SDI capabilities in areas that will deliver the most benefits to their current pressing needs. Most do not have a formal “spatial information strategy” across the whole administration. However, most countries covered by this project have national (and in some cases regional) SDI strategies. At this stage it is not clear what connection there is between national and local strategies or how national strategies will meet the needs of cities. Some cities, for example New York, have developed an intranet that could be used to access spatial data held across multiple units. 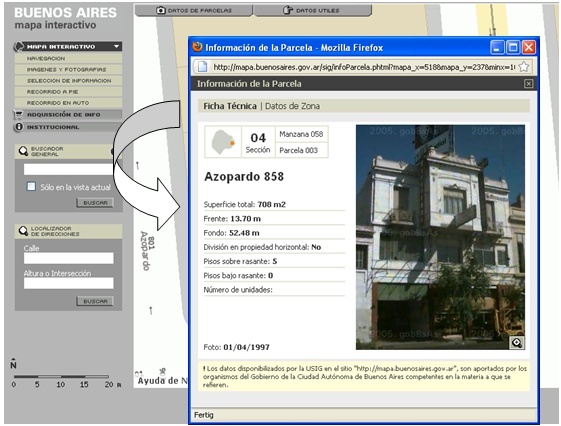 Other cities, such as Buenos Aires (Figure 7), have invested in providing access to spatial data as part of their public websites, reporting information about aspects of city administration such as land tenure, use, planning, environmental and disaster management information. Approaches like these should be used as exemplars by other cities. Although Norway does not have megacities, the Norwegian SDI provides a model for an application of spatial data infrastructure in a democratic society enabling citizen participation in policy and decision-making for city management (Figure 8). New tools, techniques and policies are required to baseline and integrate the social, economic and environmental factors associated with megacities, to monitor growth and change across the megacity and to forecast areas of risk – all within shorter timeframes than previously accepted. Moreover, they must be flexible enough to meet traditional needs such as land development, tenure and value applications, but be designed to be interoperable and integrate within the city wide SDI as it evolves. Access to integrated spatial information from the SDI will lead to more joined-up, proactive decision making allowing the prioritising of scarce resources to tackle the most sensitive and risk prone areas within a megacity. These tools must support the operation of land administration functions, but should also support the management of key problems such as disaster management, flooding control, environmental management, health and transportation, for example, but also encourage economic development and reduce social inequalities. Data collection (Figure 9) & maintenance – high resolution satellite imagery (< 0.5m) is now commercially available at an affordable rate from a number of sources with repeat coverage at a frequency greater than required for this application. This opens up the possibility to efficiently generate topographic and thematic mapping (at a scale of at least 1:5,000) and to better understand changes across the city, such as sporadic creation of informal settlements (Figure 10, 11). Data integration and access – international interoperable information and services standards allow the possibility of the real-time merging of data and services (plug and play) from a variety of sources across the city. This will be achieved through the creation of shared, web information services to allow users access to the wide range of information held by different agencies across the city. This will be instrumental in breaking down information silos and will lead to the innovative re-use of spatial information. Data analysis - data mining and knowledge discovery techniques allow the integration of a wide range of spatial information and associated attribute information. This creates the opportunity to perform more effective forms of analysis and decision-making, leading to more cost effective solutions such as targeting of limited city resources for health care and maximising the economic benefits of investments in transportation. 3-D city modelling (Figures 12, 13, 14) - many applications are enhanced by the use of 3-D spatial information, such as visualisation of planning development proposals, flood predictions, modelling population growth, tourist visit simulations and the design of transportation networks. 3-D spatial information of the natural and built environments is increasingly available, e.g. through LiDAR and terrestrial laser scanning, making many of these applications operationally viable. Citizen centric urban sensing – The new generation of urban sensors, including cellular phones (Figure 15), has potential for providing managers with access to a range of current spatial and environmental information about the evolving activities of their megacities. By these means peoples’ movements can be monitored; their use and modes of transport determined and people could voluntarily provide information about changes to their environment. A system of quality analysis of information and data voluntarily submitted from unofficial sources. A communication strategy to provide transparency and to ensure that citizens understand the benefits. It is probable that people will participate when provided with smooth and ubiquitous access to information and the ease of providing information through m-government applications, for example. The increased levels and quality of participation will most likely take time to evolve as citizens gradually realise tangible evidence of urban improvements related to their participation. One initial consequence may be that city authorities just receive hundreds of trivial requests for services. This traffic must be managed effectively and acted upon in a beneficial manner by city authorities to build trust with the citizens. The successful introduction of urban sensing will involve considerable cultural and behavioural change of politicians, government officials, the business community and citizens and develop incrementally as policies and legislation evolve. It has great potential to fill the current gaps in urban information needed to understand the dynamics of megacities. At the national level, no country has so far generated data management policies that truly integrate and utilise this new approach. In Doetinchem in the Netherlands, a 12 metre tall tower (Figure 13 right) maps emotions of the inhabitants. The tower changes the lights according to emotions reflected from the D-tower website (www.d-toren.nl). Devices as citizen-activated sensors, RFID and LBS may provide government with efficient and practical means of data collection in support of urban management and environmental monitoring. However, these devices are also potential tools for citizen control by totalitarian governments. What may begin as traffic control may be adapted to crowd and demonstration control. The D-Tower of the Netherlands could easily become a device designed to give a repressive government of some other country a means of early detection and suppression of popular dissent. All such “urban sensing” devices must be subject to full public awareness and acceptance. There must be an enactment of enabling legislation. Due process must be available to the citizenry of any democracy, including judicial challenge and final adjudication. As these devices are currently in experimental stages primarily in countries with developed economies and long established democratic processes, there may be concerns that there would be a major risk in introducing such systems in unstable governments in developing economies. Citizen participation in data collection must be voluntary and data collection methods must be transparent and open to public understanding. Advances in developing megacity SDI will only occur when senior management are convinced of the benefits through experience derived from business case studies and only when SDI implementation is guided by a supportive megacity information strategy. However, it is difficult to achieve this type of strategy in the complex multi-layer governance structures of the megacities. As spatial information is used more commonly with more citizen awareness, there is a risk of popular mistrust concerning privacy issues. It is therefore essential that policy frameworks are established legally for the appropriate use of spatial information. It is also important to raise public awareness about the benefits citizens will enjoy through SDI, mainly due to increased transparency in city governance; and the opportunity for public participation in decision-making. It must be recognised that citizen participation in information gathering suggests certain risks like the concern for privacy; suspicion of governmental intrusion and loss of public support; the issue of quality of data collected by non professionals and the need for quality analysis; the danger of miss-use of citizen-provided information by repressive governments; and the question of the capacity of governmental agencies to monitor, evaluate, and interpret the volumes of data collected in certain urban sensing systems. Special thanks go to the correspondents in the seven megacities used as case studies, to Prof Rahmi Nurhan CELIK, Istanbul Technical University and Anthony ADEOYE, Lagos city administrator. To Gerasimos APOSTOLATOS, FIG Com3 vice chair of Administration and all FIG Commission 3 delegates who have participated and prepared coordinated research papers in the three annual workshops is gratefully acknowledged. To the Technical Chamber of Greece for its continous four-year support of FIG Commission 3 relevant activities and for hosting the annual 2007 Comission 3 Workshop; to the Spanish Association of Surveyors and to DVW German Association of ¬Geodesy, Geoinformation and Land Management for hosting the annual Commission 3 workshops; and to the French Order of Surveyors for hosting the final expert group meeting in Paris. Special thanks to Prof Stig ENEMARK, President of FIG, for providing strategic guidance in identifying urbanisation as a key global issue in supporting the Millennium Development Goals. Abo Akel N., Filin S., Doytsher Y., 2009. "Reconstruction of Complex Shape Buildings from LiDAR Data Using Free Form Surfaces". Photogrammetric Engineering and Remote Sensing, 75(3):271-280. Albrecht K. 2008. "RFID Tag – You’re It". Scientific American, 299(3): 48-53. Albrecht K., McIntyre L., 2006. "Spychips: How Major Corporations and Governments Plan to Track Your Every Move". Published by Plume (Penguin), Oct. 2006, ISBN 0452287669. Avrahami Y., Raizman Y., Doytsher Y., 2008. 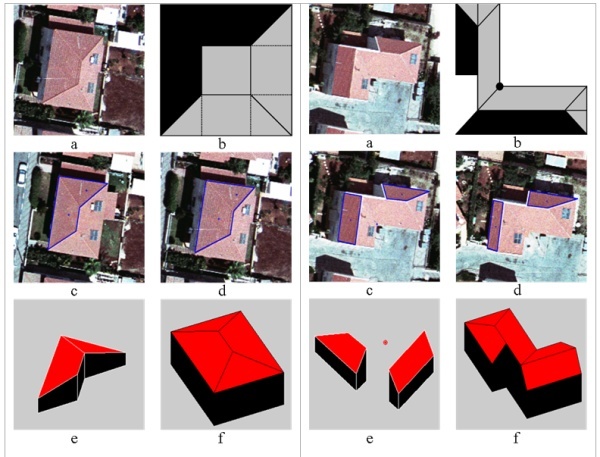 "A Polygonal Approach for Automation in Extraction of Serial Modular Roofs", Photogrammetric Engineering and Remote Sensing, 74(11):1365-1378. Baltsavias E.P., 2004. "Object Extraction and Revision by Image Analysis Using Existing Geodata and Knowledge: Current Status and Steps towards Operational Systems". ISPRS Journal of Photogrammetry & Remote Sensing, 58(3-4):129-151. Boos S, Müller H., 2009. 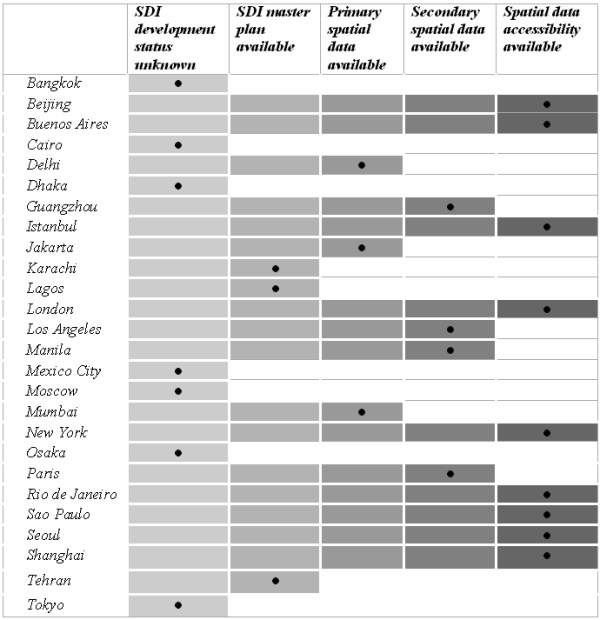 "SDI Developments in the World’s Currently Existing Mega Cities". http://www.fig.net/pub/monthly_articles/april_2009/april_2009_boos_mueller.html, FIG Article of the Month, April 2009. Clinton W., 1994. "Coordinating Geographic Data Acquisition and Access: The National Spatial Data Infrastructure", Executive Order 12906, April 13, 1994, Federal Register, 59 (71): 17671-17674. Cuff D., Hansen M., King J., 2008. "Urban Sensing: Out of the Woods". Communications of the ACM, 51(3): 24-33. Enemark S., 2007. "Integrated Land-Use Management for Sustainable Development". Proceedings of the Joint FIG Commission 3, UN/ECE Working Party on Land Administration and UN/ECE Committee on Housing and Land Management Workshop, Sounio, Greece. European Union, 2007. "Directive 2007/2/EC of the European Parliament and of the Council of 14 March 2007 Establishing an Infrastructure for Spatial Information in the European Community (INSPIRE)". Official Journal of the European Union, L108:1-14. Habib A., 2009. "Integration of Photogrammetric and LIDAR Data for Accurate Reconstruction/Visualization of Urban Environments". Proceedings of the FIG Com3 Workshop on Spatial Information for Sustainable Management of Urban Areas, Mainz, Germany. Hofmann P., Strobl J., Blaschke T., Kux H., 2006. "Detecting Informal Settlements from Quickbird Data in Rio De Janeiro Using an Object Based Approach". 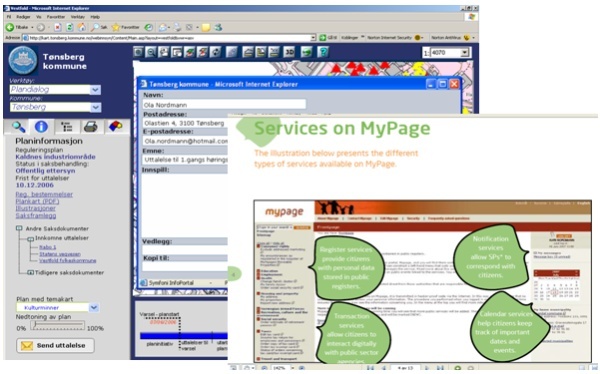 International Archives of the Photogrammetry, Remote Sensing and Spatial Information Sciences, Salzburg, Austria, XXXVI(4/C42), unpaginated CD-ROM. Hurskainen P., Pellikka P., 2004. 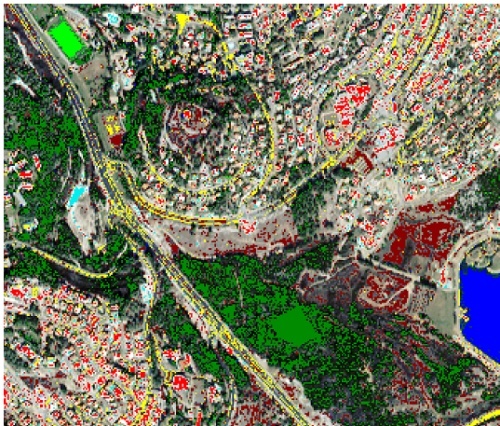 "Change Detection of Informal Settlements Using Multi-Temporal Aerial Photographs - The Case of Voi, SE-Kenya", Proceedings of the 5th African Association of Remote Sensing of the Environment conference, Nairobi, Kenya, unpaginated CD-ROM. Ioannidis C., Psaltis C., Potsiou C., 2009. 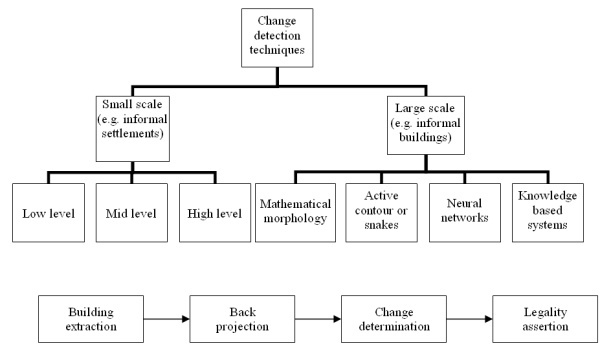 ”Towards a strategy for control of suburban informal building through automatic change detection”. Journal of Computers, Environment and Urban Systems (CEUS), 33(1): 64-74. Kelly P., 2007. “Role of Spatial Data Infrastructures in Managing Our Cities”. Proceedings of the FIG Commission 3 Annual Meeting, Sounion, Greece. Kelly P., 2008. "Current Problems and Issues in Using SDI in Mega cities", Report of FIG Working Group 3.2: Spatial Data Infrastructures in Megacities, unpublished. Lavedan P., 1926. "Histoire de l’ Architecture Urbaine", t.1, H. Laurence, Paris. Potsiou C., 2008. "Unplanned Urban Development and the Need for Good Spatial Information Infrastructure". Proceedings of the FIG Commission 3 Workshop on ‘Spatial Information Management toward Environmental Management of Mega Cities’, Valencia, Spain, unpaginated CD-ROM..
Potsiou C., 2009. "Tools for Legal Integration and Provision of Environmental Improvements in Informal Settlements in Europe – A case study from Albania and Greece". Global Land Tool Network, UN HABITAT, (to be published). Sester M., 2009. "The Potential of Geosensor Networks for Sustainable Management of Urban Areas". Proceedings of the FIG Com3 Workshop on Spatial Information for Sustainable Management of Urban Areas, Mainz, Germany. Steven A.R., 2005. "The US National Spatial Data Infrastructure: What is new? ", Proceedings of the ISPRS Workshop on Service and Application of Spatial Data Infrastructure, Hangzhou, China, XXXVI(4/W6). Trimi S., Sheng H., 2008. "Emerging Trends in M-Government". Communications of the ACM, 51(5): 53-58. Tsenkova S., Potsiou C., Badyina A., 2009. "Self-Made Cities – In Search of Sustainable Solutions for Informal Settlements in the United Nations Economic Commissions for Europe region". United Nations Economic Commission for Europe (UNECE), United Nations Publications, ISBN 978-92-1-117005-4, Geneva, p. 113. United Nations Population Division, 2006. "World Urbanisation Prospects: The 2005 Revision", New York. Williamson I., Enemark S., Wallace J., Rajabifard A., 2009. “Land Administration for Sustainable Development”. ESRI press, ISBN 9781589480414, United States, p. 512. Williamson I., Rajabifard A., Binns, 2006. "The Role of Spatial Data Infrastructures in Establishing an Enabling Platform for Decision Making in Australia". Proceedings of the GSDI-9 Conference, Santiago, Chile. World Bank, 2009. "World Development Report 2009, Reshaping Economic Geography", The International Bank for Reconstruction and Development / The World Bank, ISBN 978-0-8213-7607-2.